Charming, simple, and straightforward – that’s the food at the Hungry Monk Café. Located in Cong, Co. Mayo, the Hungry Monk Café offers an array of soups, sandwiches, salads, and homemade cakes and desserts which will satisfy anyone who is hungry – whether of the monk persuasion or not. We ducked in one sunny afternoon to find the small café filled with locals. The Hungry Monk is bright and cheerful as is the service. I ordered a BLT which came on toasted bread with Irish bacon – delicious. My companion raved about her chicken sandwich served on a freshly-made roll. They serve great fair-trade coffee, and the café pours generously. 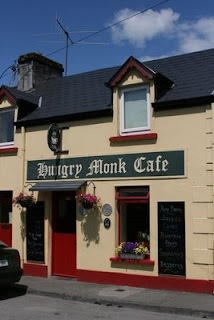 The rich coffee compliments the fantastic baked goods which make the Hungry Monk a destination. With everything from chocolate brownies to lemon cake, cranberry coffee cake to berry pie on the menu, choosing was difficult. But it is hard to imagine making a wrong choice. A helpful note for travelers, the Hungry Monk also has a computer with internet access which is available for a small fee. The only problem with the Hungry Monk: it isn’t always open. Cong is a small town, and much of its commerce is tourism-related. The Hungry Monk is generally closed during the months of January and February, and in November and December they are only open on the weekends. However, the darling little lunch spot is open every day during the summer, and while you may enter with a grumbling stomach, I guarantee you won’t leave hungry. YUM! thanks for the great rec! For some reason, I would have expected a vegetarian food from a restaurant with "monk" in the title. Perhaps I've spent too much time in Asian countries where many of the monks ARE vegetarian. None the less, this looks like a great find and I love the photo!